Want to experience the world by rail? It’s never too early to start planning out that bucket list rail vacation you’ve been dreaming about taking. With the new year right around the corner, Railbookers is here to present some of the best rail vacations to take in 2019. All of Railbookers vacations are completely customizable, so if you want to add days to your journey, experience a package in reverse, or even break up your journey with a river cruise, we can help you plan it all. 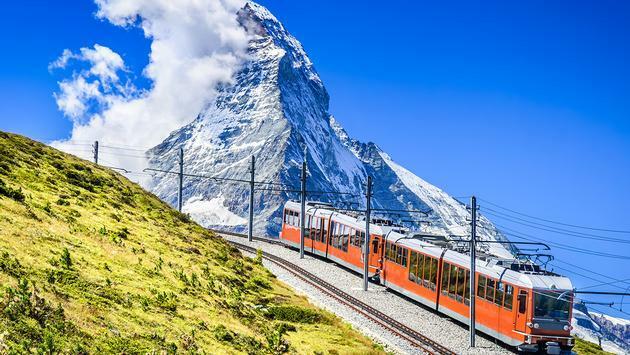 Enjoy the sights of the iconic Matterhorn Mountain, Mount Pilatus and more on an all-encompassing eight-night rail odyssey of Switzerland. First, you’ll enjoy two nights in St Moritz, followed by two nights in Zermatt, one night in Lausanne, and finishing with three nights in Lucerne. Take a Grand Tour of Europe by train, sampling six of the continent’s best cities—Berlin, Amsterdam, Paris, Geneva, Venice and Rome—on this 11-night vacation. Explore each city in full with added extras from hop-on, hop-off bus tours to city passes and skip the line entrance tickets. Who doesn’t want to experience the splendor of the Canadian Rockies? A grand rail journey with Rocky Mountaineer and VIA Rail allows you to travel along the Fraser River and Canyon to places no cars can go. Spend time exploring the iconic emerald lakes and beautiful waterfalls in the heart of the Canadian Rockies. All of this and more is just waiting for you. To learn more about Railbookers and their many rail vacation offerings, visit their blog page here. Railbookers a leading operator of independent rail vacations, offering a wide and growing range of expertly planned vacations by rail across Europe, the USA, Canada and beyond.